Cycling and the Tram Extension – A Report on a Spokes Meeting. Dr Caroline Brown runs the Q&A session with an audience of around 100 attendees, some of whom had beards. With the consultation for the completion of Edinburgh’s tramline to Newhaven about to get underway next week, SPOKES picked a good time to hold their meeting on “Cycling and the Tram Extension”. The meeting got underway with Dave du Feu (SPOKES) outlining how the tram had benefitted active transport in our Capital – not least because bikes have been allowed on board. However, he noted that the tram scheme was arguably responsible for many accidents and one death among Edinburgh’s cycling community. He noted, however, that the death had triggered a safety review and the latest round of “Tram Route Cycle Safety Improvements” is currently out for consultation. The key message here was that the Council should not repeat the mistakes of the past. Whilst introducing the Council’s Transport Convenor, du Feu made the point that “temporary” road closures for the construction of the existing Edinburgh Tram project had resulted in at least one hugely positive permanent improvement, the closure of Shandwick Place to cars – an example which the present Council could repeat in the tramline extension project. It was also noted that the City Centre Transformation Project offered huge potential. The Transport Convenor’s talk overwhelmingly focused on the merits of the tram extension. These were arguments that largely agreed with my own, but she did make an explicit link to the Tram Route Cycle Safety Improvements & the City Centre Transformation Project. Rob Leech (Edinburgh Tram, York Place to Newhaven Project Director) presented the planned route of the project and the likely impact on cycling provision. He made clear that between Pilrig Street and Newhaven his view was that there would be insufficient road width in many places to retain the existing cycle safety measures without losing parking/loading space, and the Council was proposing prioritising the latter. 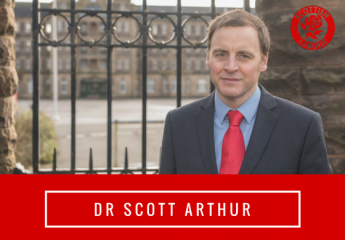 He made clear, however, that this matter and the temporary lane closures on Leith Walk (only one lane southbound will remain open) could be commented on as part of the consultation. To support businesses during this period, Leech stated that the Council would trial using cargo bikes to make deliveries. Although it was stated that the plan presented in the consultation was a ”straw man”, it was also made clear that the tram route and how the vehicles are powered (via catenaries supported by central pylons) could not be changed – the significant argument for the latter was that they were a sunk cost. This final presentation came from Martin Lings (the City of Edinburgh Council’s Active Travel Officer dealing with existing tramline safety measures). Lings provided a good overview of how the council was trying to reduce the cyclist accident rate along the exiting tram line (ibid) by focussing on accident “hot spots” by applying the very latest international safety guidance. Martin Lings demonstrated a passion for the subject and a clear understanding of the wider cycle network. He openly welcomed Daisy Narayanan being seconded from Sustrans to work on the City Centre Transformation Project. Lings further suggested Narayanan would also be working on the accident “hot spots”. Following these three short talks, Dr Caroline Brown chaired a discussion session. The main focus of this was the loss of the segregated cycle path on Leith Walk south of Pilrig Street – the feeling was that it was a backwards step. There was a great deal of frustration about this perceived prioritisation of cars over active transport and some attendees felt that perhaps the Council was seeking a compromise where it should be doing what they felt was the right thing. There was a suggestion that the temporary closure of lanes on Leith Walk could be used as an experiment to study the impact of reducing traffic on the route and the plans could be amended if justified. Rob Leech responded saying that would possibly mean making a variation to the contract – a potentially costly business. Although there was some disappointment about cycling provision, there was very little opposition to the proposal to extend the tram. The meeting ended with Dr Brown suggesting that people take the consultation at face value and engage with it fully once it got underway. ← Right now the SNP is simply failing too many people on housing.